At this point, we’re all fairly used to the mash up of digital and instant photography that’s offered by the classic Polaroid brand. The company is now entering its 80th year, and to celebrate it’s announcing another instant digital camera called the Pop at CES 2017. 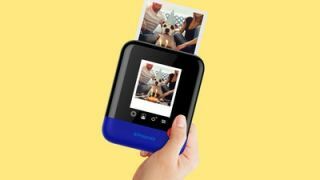 Like previous offerings from Polaroid such as the Snap and the Touch, the Pop is a digital camera that allows you to capture and store photos, or instantly print them using inkless Zink photo paper like the cameras of days gone by. When it comes to appearance, though, the Pop offers something a little different; it’s more square and fun looking than previous Polaroid digital models, looking less like a digital camera and more like a flattened version of the brand’s original cameras (or the Instagram logo). What’s more interesting about the Pop, though, is that the specs it’s offering are actually fairly attractive. Polaroid is ramping the megapixels up to 20, and is offering dual LED flash as well as the ability to record 1080p full HD video. These are by no means ground-breaking specs, but as far as instant digital cameras go, they make the Pop worth considering. The camera also has a 3.97-inch LCD screen to view your photos on, a microSD slot, a self-timer, and three colour modes. Like other models, the Pop can also connect to your phone via Wi-Fi or Bluetooth so you can print photos from there too. For a real throwback to Polaroid’s roots, the Pop will also allow you to print full color photos in the iconic 3x4 format with the classic Polaroid border logo. The Polaroid Pop isn’t planned for release until the end of 2017 so there’s no pricing available just yet but we’ll update if and when that changes. A new year means new tech. Don't miss all the latest CES 2017 news straight from Las Vegas.